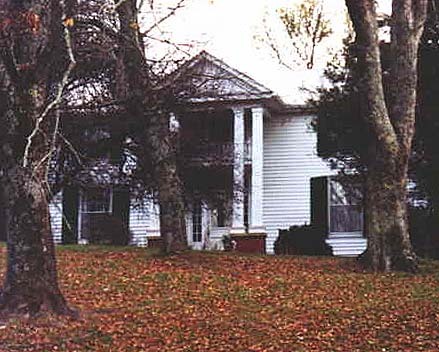 THIS DANCYVILLE HOME WAS BUILT BY ALLEN PETTUS GILLIAM (1810-1885). THIS HOME. PHOTO USED BY PERMISSION OF THE CURRENT OWNER. PARENTS (FRED TYRRELL & MARY SEARS ROGERS JONES) WERE MARRIED IN THE HOME ON NOVEMBER 11, 1934. I DO HAVE THREE PIECES OF FURNITURE THAT WERE IN THE HOUSE. GRANDFATHER (MILLARD HUNTER JONES) BUT I DON'T KNOW IF IT BELONGED TO A.P. GILLIAM. ADDED A WALNUT BORDER ALL THE WAY AROUND TO MAKE IT EASIER TO FIT CHAIRS UNDER THE TABLE. THE TABLE HAS THE MOST BEAUTIFUL PATINA. ALLEN PETTUS GILLIAM MARRIED (1) ELIZABETH E. COLBURN (2) ELIZABETH OLIVIA PATTON NEAL. ALLEN P. & ELIZABETH COLBURN GILLIAM'S SIXTH DAUGHTER WAS MARY PRISCILLA. GREAT-GREAT-GRANDPARENTS OF THE PUBLISHERS OF THESE PAGES.